The Old City of Acre is renowned for its Crusader buildings and its Ottoman walled town. In 1104, during the First Crusade, the Crusaders made the town their chief port in Palestine. The Ottomans under Sultan Selim I captured the city in 1517, after which it fell into almost total decay. Towards the end of the 18th century it revived under the rule of Dhaher al-Omar and his successors. Akko is a great place to visit. The ancient sites are amazing, but also there is a very old, authentic shuk. You can also walk along a beautiful beach. The Old City of Acre really has 2 aspects to it – the external experience of the narrow mediaeval streets/souks, walls and harbour and the interior experience of the “pay to visit” sites – in particular the Crusader City. The external aspects are pleasant enough with some nice views of and from the ancient walls of the town and harbours and, in the souks, what an earlier reviewer has called a “Jerusalem Feel”. Some parts have been restored but others are very run down- particularly some of the Khans. Yet, it was amazing how many run down buildings had a big notice stating that “This property is not for sale”! I guess there are investment plans which have yet to come fully to fruition. An understanding of this background will help understand the nature of the offering made to tourists. 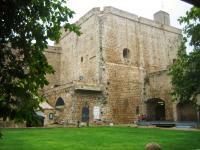 This consists of tickets for multiple attractions in the form of “The Crusader Citadel plus….”. So, you cannot buy a ticket for the castle without also buying a ticket for a Modern Art Gallery (“The Okashi Art Museum ….hosts temporary exhibits of Israeli art alongside a permanent exhibition of the works of Avshalom Okashi”) and an ethnological museum (“The Treasures in the Wall Museum is the product of 2 collectors Dan Hortman and Michael Luria. The Items on display shed light on the fabric of life in the Galilee over the past 150 years”). Beyond these the Turkish Hamam has been developed into an “experiential” audio visual tour and requires a separate add on ticket even if you don’t want the previous 2 museums! We didn’t work our way any further down the list of combination tickets and add-ons – at least they offered old fogie price reductions to all old fogies and not just Israeli old fogies as the National Parks did – but only from 46 NIS pp to 39!. Once you have worked out what the best combination might be for your interests (or at least the least bad!) you pay your money and go on to the Audio Guide dispensing office. The little gismo you get in return for leaving your passport as collateral (not of the latest design – other sites had ones which were automatically triggered) is supposed to tell you what you are viewing when you key the number of the “station” you are at. You also have a “map” (designed by someone with no feel for cartography!!) to enable you to position yourself at the next station. Unfortunately the map was often wrong, the station numbers were often illegible or hidden or in a different place or not in sequence, some of them seemed to be operating 2 different numbering systems and others were completely missing (this may owe something to the fact that the area seemed to be undergoing rebuilding to put in place a new exhibition area). The net result - total frustration! You also receive 2 different sets of instructions as to the route for your visit – 1 given at the gismo office consists of seeing the Citadel, returning to the start and handing in your gismo and then setting off across the town to find your other ticketed “attractions”! The other, given at the ticket check consists of leaving the Citadel through another exit at the far side after your visit straight into the souk, finishing your other “attractions” and then returning through the town to hand in your gismo from the outside to get your passports back! We did the latter and found our way ok with a bit of asking but they really should do a better job at signing – we met another group of non Hebrew/Arabic/English speakers who were hopelessly lost in the twisting souks! I can’t say I was particularly impressed with the Crusader Citadel and don’t believe that the frustrations with the audio system played much part in this. There are a lot of vary large arcaded underground “Halls” used by the Hospitaliers (photo) but, to us at least, these all merged together and the impact of some of them had been destroyed by the introduction of large (as yet) empty display cases for some future exhibition. There were a few courtyards as well but the views of these were disfigured by the scaffolding of external reconstruction. We moved on to the “Turkish Bath House – The Story of the last bath attendant”. Now I usually avoid such “experiential” events like the plague and despise myself when I get caught up in one – but this caught us unawares. I discovered later that it promised a “dramatic exciting and informative sound and light show” (as well as “mock steam”!!). Actually it was better than I feared when I realized what I had got us into! The Okashi museum took 30 seconds – not our scene at all. The “Treasures in the Wall Museum” was an annoyingly long way away from everywhere else along the city wall which again was not well indicated and might be of interest if one had lots of time to fill but you could see why they got people into it via the “inclusive ticket” ploy. Which left the final “attraction” included in our ticket – the 350 m long Templar Tunnel from the fort to the port. Now I have never been in so many tunnels as on this trip – from Megiddo to Beersheba to Jerusalem to Akko ….. This one was ok with a couple of interesting slide shows playing on the walls but I could have done without it. Further up the Isreli coast, just as you've passed Haifa, you reach to the old town of Acre. Or Acco, which is the locals name for the town. For me it was a rainy day in December and having reached the town by train, I hopped into a taxi in order to quickly get to the older parts of the town, located right next to the Mediterranean seaside. They say that the weather makes half the experience and this time it was a wet one. But with the sun on your side Acre is a brilliant little town which history dates back to Canaanite times. 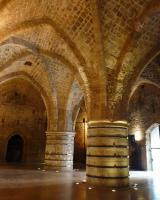 Acre has somewhat of a 'Jerusalem feel' to itself but actually reflects the time of the Crusaders and the Arabs. Actually, it is the ruins of the 'Crusader City' that today is Acre's major attraction. When the Ottomans rebuilt Acre, they did so on top of the old Crusader City which lies 25 feet below that of today. It has now been unearthed, revealing big Gothic halls and underground tunnels. And if that isn't enough, a visit to the Mosque of El-Jazzar, the bazaars and a lunch by the seaside will easily kill more than a couple of hours. 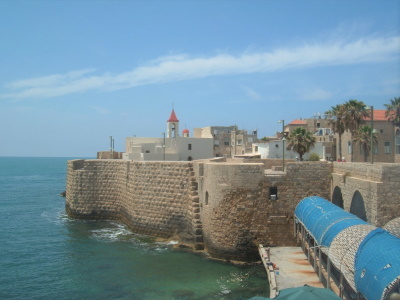 Acre is easily accessible from Tel Aviv or Haifa and definitely worth a visit. Akko/Acre/Ptolomais has been occupied by Greeks, Romans, Persians and Egyptians, as well as the Phoenecians, the Crusaders, the Ottomans and the British. Under the Ottomans the city achieved notoriety as a prison city; amongst its notable prisoners was Bahau'llah, founder of the Baha'i Faith. The British continued the tradition by incarcerating and executing a number of notorius Jewish 'terrorists'. The prison museum is open to visitors. Less traumatic to visit are the Ottoman inns or khans. In these inns merchants from all over the Mediterranean area came to conduct trade. Ottoman Empire: Ottoman walled town. Knights Templar : Became the Order's HQ until 1291 after Saladin had taken Jerusalem in 1187. Napoleon was here: Besieged by Napoleon. If he ever set foot in the town is not known. Edward I: During the 9th Crusade, the only city in the Holy Land then still under Christian control was relieved from an Egyptian siege by Edward in May 1271. He survived being stabbed there with a poisoned dagger by an "Assassin" and was supposedly saved by his wife, Eleanor of Castile, sucking the poison! His Daughter was called "Joan of Acre" having been born there. Built in the 12th century: Crusader period: "the city gained international significance from 1104 to 1291 as the capital of the Crusader kingdom of Jerusalem "
Built in the 18th century: Ottoman walled town: "flourished again in the 18th century as the capital of this part of the Ottoman Empire"
Built or owned by British: The Citadel was used as a prison (and place of execution) by the British during the Mandate. 170 Community Members have visited.